Okay, so maybe you're too late to get these in before Nemo drops a foot of snow on your doorstep, but at least you can be ready for next time. 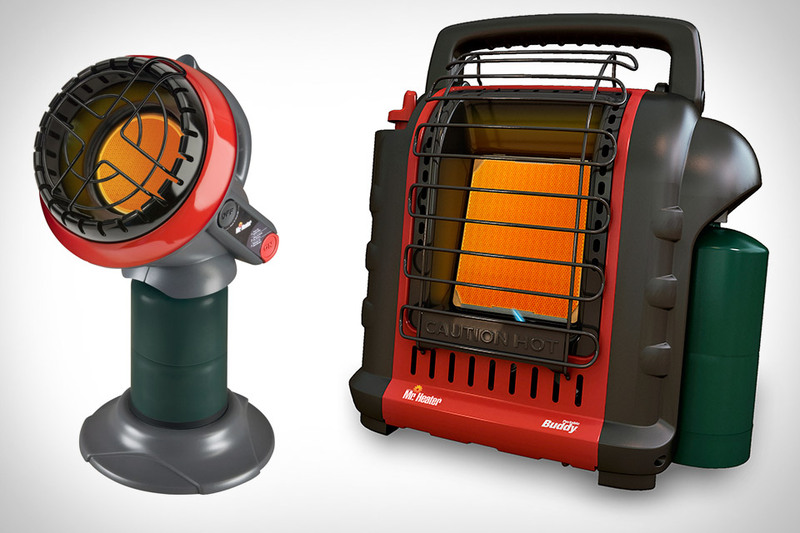 Available in 100- and 200-square foot models, these Mr. Heater Buddy Propane Heaters ($50-$90) promise to provide hours of safe heat using nothing but standard propane tanks. The smaller of the two stands just one foot tall and uses a 1-pound propane cylinder for fuel, while the larger model cranks out up to 9,000 BTUs of heating power and runs off grill-sized propane tanks. No matter which model you choose, you can rest easy knowing both have low oxygen sensors and a tip over switch that will shut things down if the unit gets knocked over. Why bring both a headlamp and a lantern with you when one item can do the job of both? The Mammut T-Trail Headlamp + Light Dry Bag ($33) functions as a super-lightweight, 30-meter headlamp when you're on the trail, and then attaches to the included ambient light dry bag to provide pleasant diffused light once you've reached your destination. As the name suggests, you can also use the dry bag to protect valuables on the go or in bad weather, making this camping/survival tool a three-birds-with-one-stone proposition. No, you're not Batman. And you don't have a Utility Belt. But you can get close with the Bear Star ($85). This titanium line thrower makes sure that you'll get your bear bag (For non campers: a bag full of food and whatnot that you don't want near you while your sleeping in case Yogi comes calling) up and into an awarding winning height. The Bear Star also keeps your line tangle free (50 feet of highly-visible cable is included). Does not include a mask, a billionaire alter ego, or parental issues. Keep your electronics from the elements inside the SmithFly Digi Pouch ($60). Crafted from heavy-duty 18 oz. vinyl, the Digi Pouch features Molle webs on a welded patch in the back of the bag, allowing it to work with pretty much any Molle-webbed thing out there while leaving its roll-top design completely water tight. Perfect for DSLRs, phones, or any other mission-critical gadgets. There's a reason eskimos lived in igloos — the shape is incredibly efficient at using heat. Now you can pack your own igloo up the mountain with the The North Face Dome Tent ($5,000). Offering an impressive 125 sq. ft. of interior space, this hemisphere-shaped tent can hold up to 8 people, weighs just 45 lbs., and collapses down to just 32" by 23". Other features include dual doors, two exterior windows with a chimney vent, and a rugged nylon Oxford exterior. It may seem expensive, but if it keeps you afloat in an avalanche, it'll seem like a bargain. The North Face Patrol Avalanche Airbag Pack ($1,200) is a fully serviceable backpack, with internal pockets in the main compartment for organization, a ski or snowboard carry system, and a large tool pocket. The real highlight, however, is the integrated ABS airbag system that, with a pull of the handle on the left shoulder strap, uses compressed nitrogen to inflate two large airbags that will help keep you on the surface and make it easier for rescuers to find you. With a 95% success rate in real-world use, it might just be a life saver.